Each session about 175 boys and young men aged 8-15 call North Star home. Our size allows us to offer an extensive program to meet the diverse interests of our campers, while maintaining a tight knit community. We strive to be a diverse and inclusive community, working to help our campers grow in a world with a wide variety of backgrounds and views. There is significant interaction between age groups and our programming brings the entire camp together in a meaningful way. 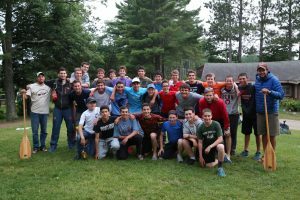 Our senior campers take an active role with our younger campers by way of our Senior Leadership Program, assisting in younger cabins and with instruction in activities which they have become proficient in. Our campers come from suburbs and cities across the United States, as well as many campers from other countries. When we have visitors at camp, we often hear comments regarding how polite and helpful our campers are. We are proud of the respect and kindness our boys display throughout the summer. Most will come for one of our four week sessions, however about 1/3 of our campers will stay for the entire eight-week summer. North Star boasts a high return rate as many of our campers return from one summer to the next. Our older campers have been with us for up to six or seven summers. We welcome many new campers in most age groups every summer as well. We are confident that a new camper, whether nine-years-old or fourteen, will be welcomed into his cabin group. Campers are placed into cabin groups based on their school grade and age. Younger cabins typically have around eight kids with three or four counselors. Cabins of 12 and 13-year old campers may have as many as ten or eleven kids and three counselors. Senior Village (14 and 15-year olds) may be in slightly larger cabins, often with about 12-14 kids per cabin.